Looking to add a rich sense of warmth, classic sophistication and suppleness to your home? Look no farther than hardwood! For a hardwood floor to stand the test of time in our Colorado climate, it is crucial to choose the right species of wood and to make sure that is properly acclimated and installed. 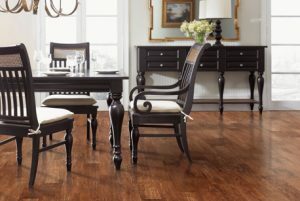 Hardwood floors are a classic, beautiful and elegant choice for any Colorado home. From domestic styles to exotics and from solids to engineered - one of the best things about working with hardwood is that you have so many beautiful and functional choices. We are here to ensure that you get the floor that will look and perform its best - for the long run! Solid Wood Floors or Engineered Wood Floors? Here’s What You Need to Know. Before you choose a hardwood floor for your home, it is a good idea to take some time to think about what the floor will do for you! Yes, that’s right. Will the floor be subjected to heavy foot traffic and be trampled upon by your beloved pets? Thinking about these questions are important because it will help to determine what type of floor - solid wood or engineered wood - will work best in your home. Just one quick word of caution; we don’t recommend any type of wood floor for a bathroom. The high probability that water will splash out of tubs, sinks and showers and onto the floor makes the risk of warping and damage too great, especially when there are so many other great options for bathrooms. Just ask us - we love talking bathroom floors, too! Produced from some of the finest domestic and exotic hardwoods including red & white oak, American cherry, hickory, maple, and Brazilian cherry - all available in several widths. Most engineered floors can be glued-down, stapled-down or floated over a variety of subfloors including wood, dry concrete slabs and some types of existing flooring. It is important to know the characteristics of your wood species. Along with the grain, width, and stain you'll want to pay close attention to the degree of hardness of the wood type. For the most part, there are subtle differences between species. Here is a simple way to visualize it: Dropping a can of beans on a wood floor will most likely leave a dent. However, the extent of the dent will vary slightly from species to species. So choosing widely, depending on what your floor will be handling on a daily basis, is important. One of the most functional and beneficial features of hardwood floors is that they can last for a very long time, and can stay looking beautiful. This longevity is helped along because wood can be periodically refinished when needed in order to restore it to its original beauty. The general rule is that solid ¾-inch hardwood boards can be refinished up to 10 times, sanding them each time to remove scuffs and stains. Floors consisting of thinner planks, unfortunately, can’t withstand the refinishing process as much as their thicker planked counterparts. Luckily, today most floors come with a durable coating, meaning they can be enjoyed without having to be refinished often. There are so many beautiful possibilities when it comes to hardwood floors. Browse our gallery and get inspired. A great feature of hardwood flooring is that it is straightforward to install. Learn more about what to expect. Cleaning and maintaining hardwood is simple and hassle-free. With just a little effort, your hardwood flooring will maintain its beauty for a long time. Used to join wood flooring with carpeted areas. Provides a smooth transition between floors of different heights and materials. Placed on stairs and landings to cover exposed edges of wood flooring. Joins two areas of wood flooring of the same height, usually in doorways or thresholds. For Engineered Hardwood Floors only. Used to join wood flooring with carpeted areas. Used to secured trims and molding to subfloor.